The World Bank’s PNG Economic Update released on 7 February is a Dr Jekyll and Mr Hyde act for the PNG government. The front macroeconomic part is undoubtedly very kind to the PNG government – it resembles the friendly support of Dr Jekyll in the famous Robert Louis Stevenson novella. There is much praise for the government and any criticism is buried away in the middle of paragraphs or implicit in graphs and specific numbers in tables – one must work hard and read between the lines to find what is really going on. One example of the friendly treatment is the very conciliatory discussion of the K3.4 billion breach (“policy deviation”) of the medium-term fiscal deficit targets agreed in the 2018 Budget and made the first condition of the World Bank’s budget support loan in only September 2018. 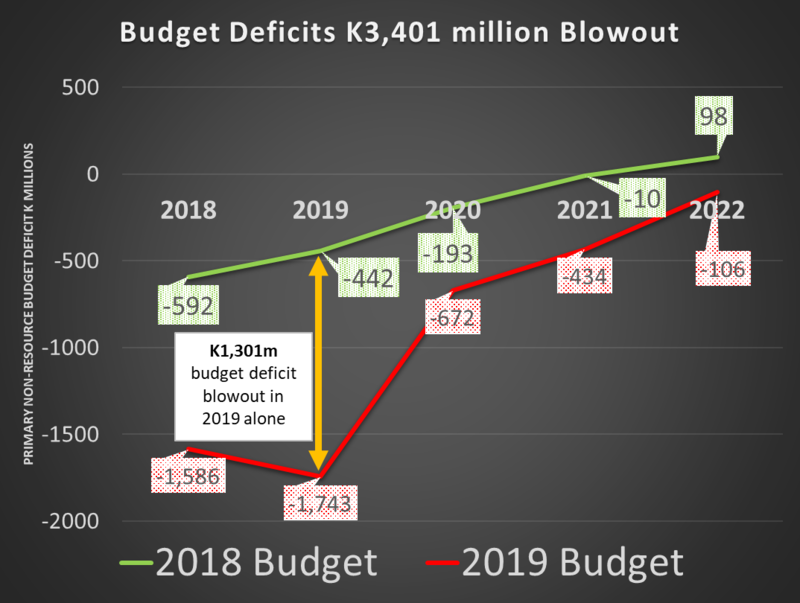 Even allowing for expenditure arrears of nearly a billion kina, K2.5 billion (or 72%) of this massive deficit blow-out from 2018 to 2022 is left unexplained. Overall, what is remarkable in the January 2019 Update is the lack of reference, yet alone analysis, of the seven key issues identified by the World Bank in its own December 2017 Update. 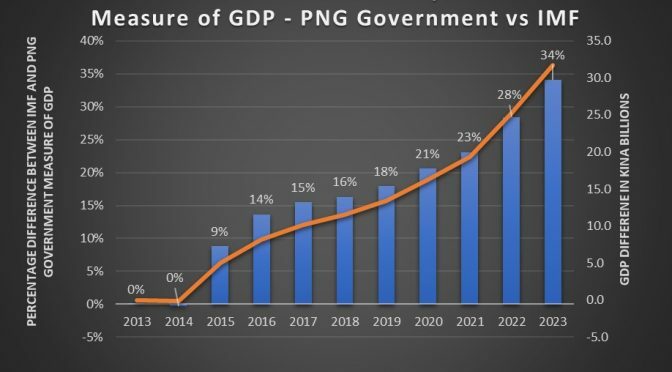 In the detailed analysis below, the PNG government has failed to implement its fiscal strategy, revenue strategy, wages strategy and measures to disentangle PNG’s budget fortunes from the whims of international commodity prices. In just over a year, the World Bank has retreated from its own benchmarks. The second part of the report has a “special focus” on the private sector, and the tone is very different. This is the Mr Hyde part of the report – the local business sector will like it but the government’s efforts over the last seven years are found seriously flawed. Especially under the heading “Removing constraints in the business environment to boost private sector investment”, the government gets a hammering for “a largely unfavourable business environment”. One section is particularly tough on the government’s proposed reserved activity list concluding “the level of business environment risk has been dramatically increased”. The detailed analysis of this second part of the report will be covered in a later article. As an analyst of these World Bank reports on PNG for over 40 years (my first policy paper in the public service in 1978 was analysing the first World Bank report on PNG after Independence, and my career included some 7 years working in AusAID or Treasury on the World Bank/IMF desk and attendance at many, many World Bank/IMF annual and Spring meetings) this is an unusual report. The current Economic Update must be read in a historic context. The World Bank’s relationship with the PNG government was essentially broken during the structural adjustment assistance of the early 2000s, especially due to the failed land reform program. The World Bank has been slowly rebuilding this relationship through normal project funding, although at a much lower level than the Asian Development Bank. This is the first PNG economic update since the budget support loan taken out in September 2018. There was a need for a public report (indeed, the initial undertaking when the first update was produced in December 2017 was for six monthly reports). The big picture is that the World Bank is extremely worried about PNG’s declining standards of macro-economic management – that is why PNG’s economic management has been seriously downgraded in recent years to a “fragile situation” country according to the World Bank’s governance indicators. So how does the World Bank try to maintain influence in encouraging better policies especially with a history of essentially being kicked out of the country? Its main stakeholder in PNG is Treasurer Charles Abel. One does not publicly criticise his macro-economic performance at this stage if seeking to maintain influence. However, it is quite possible that Treasurer Abel also has some concerns about the extremely nationalistic and anti-business policies of Minister Maru. I suspect the World Bank knew it had a green light to be discuss more openly the challenges facing PNG when talking about the private sector. In this historic context and seeking policy influence in a country with declining economic management, the report is possibly less surprising. At this new stage of the PNG Treasurer/World Bank relationship, the politics probably meant that a Dr Jekyll (nice to the government on macro-economics) and Mr Hyde (willing to publicly criticise the government on private sector policies) character was inevitable. Much of the rest of this article highlights the chasm between the macro-economic priorities set out in the first World Bank Update and the scant coverage of those issues in the second, presumably because things are not going well. The longer-term requirement, however, is that the World Bank must not only keep the PNG Treasurer happy, it has to maintain its own professional standards around analytical rigour and honesty for on-going policy credibility. In the modern era of geopolitics, one would hope that a distinguishing feature in the value sets being offered between a one-party state political system and a democratic political system is frank, public assessments of what is going on. That is why democracies have (or should have) Auditor-General offices and Public Accounts Committees with public reports. These internal institutions should be re-enforced by independent international institutions such as the World Bank. Looking forward, the World Bank should be more open and balanced in its assessments to support both its international policy advisor role as well a role in encouraging accountable democracies. One would have expected the second World Bank PNG Update to reflect on the key priorities set out in its first Update of just over a year ago. So how did things go? The following paragraphs are straight out of the press release for the last World Bank PNG Update in December 2017. How has the 100 day Economic Stimulus Plan gone? How has the 2018 Budget intent gone? 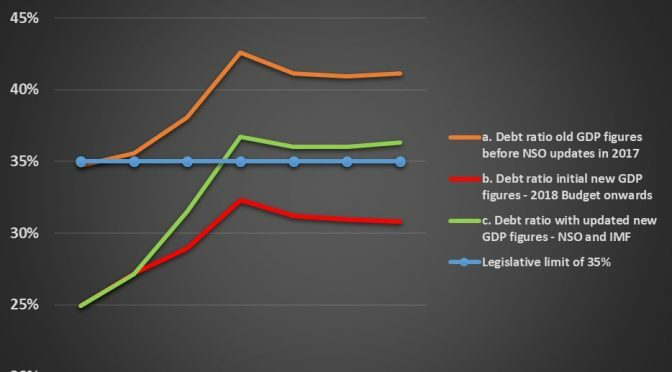 How has the Medium-Term Fiscal Strategy gone? 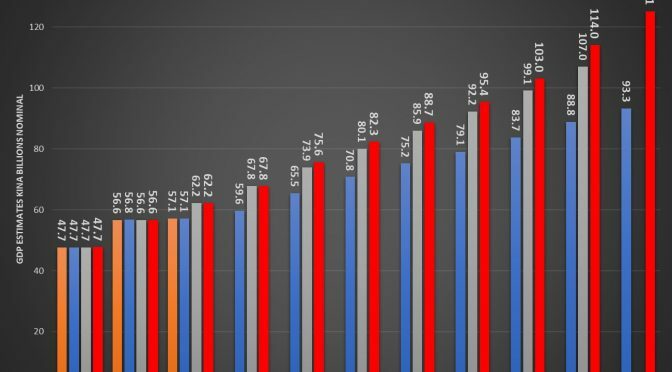 How has the Medium-Term Revenue Plan gone? How have plans to disentangle government spending from volatile resource revenues gone? How have plans to establish the Sovereign Wealth Fund gone? How have efforts gone to contain wage bill costs? What is remarkable in the January 2019 Update is the lack of reference yet alone analysis of these key issues identified in the December 2017 Update. In just over a year, the World Bank has retreated from its own benchmarks. The next section provides some analysis which should have been incorporated into the January Update. The 100 day plan is mentioned in one footnote reference (footnote 13 on page 9). Of course, even the PNG Government now calls this the “25 point plan” as the 100 day target set by Treasurer Abel was unrealistic. Did the World Bank analyse progress on the 25 points of this plan? Short answer is no. If it had done so, the answer would have been a very mixed bag indeed. 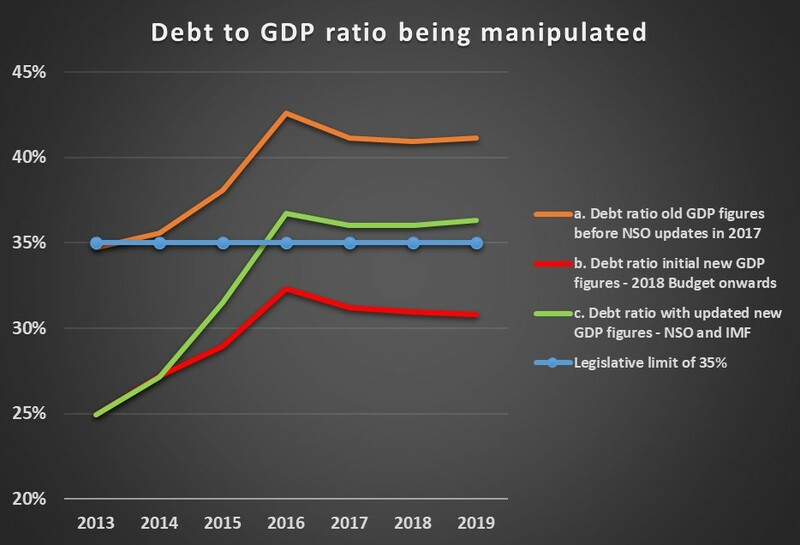 Partly this reflects poor fiscal performance (for example, the plan aimed for a 30% debt to GDP ratio in 2017 but that has now been put off until 2021 and the 2.5% deficit was only achieved by not paying some wages and public works bills in 2017), an excessively ambitious timeframe (for example, it was expected that early works would have commenced on Wafi-Golpu, PNG LNG, and even Western LNG), partly that elements of the initial plan were bad policy (such as the rice import quota scheme) and partly this reflects poor governance performance (such as audited accounts from SOEs not being available and lack of wage controls). There were some achievements, such as securing foreign exchange financing, publishing plans (although issues with quality and implementation), temporary reduction in DSIP and PSIP (then over-ruled by the Prime Minister) and solid progress on a number of donor-funded proposals. More analysis would have been appropriate. 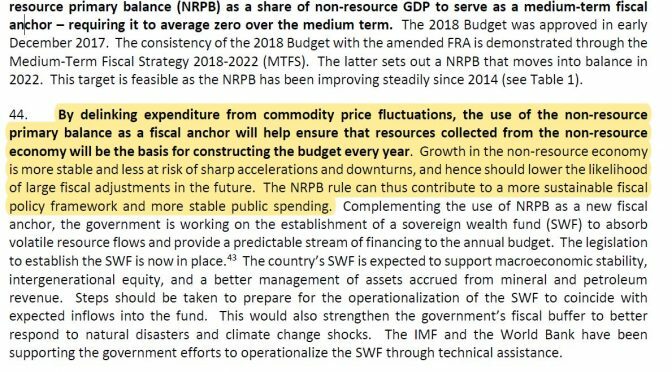 The 2018 Budget fiscal target was 1% (using the new measure put forward by Treasurer Abel of the “non-resource primary balance as a share of non-resource GDP”) but this blew-out to 2.7% (or 2.9% using IMF GDP numbers). The 2018 Budget displayed the new Treasurer’s planning heritage as it included three medium-term planning elements (fiscal strategy, revenue strategy and debt strategy). These looked fine on paper, but the challenge in PNG has always been about actual implementation. Assessing implementation against the plans should have been a feature of the report. As it did not do so, the following analysis covers some relevant issues. The Medium-Term Fiscal Strategy (MTFS) is discussed in the January Update including a summary of the 8 key targets. As stated in the latest report “As part of the MTFS framework, the fiscal rules were specified….These fiscal rules were built around a new fiscal anchor, the non-resource primary balance (NRPB) which the government targets to bring to a zero-average balance over the medium term.” So how has the government gone against this new “fiscal anchor”? Short answer, and an uncomfortable one for the World Bank, is that it has not been going well. This is probably best illustrated in the following “Figure 9” from the report. From 2014 to 2017 expenditure has been cut faster than falling revenues so the fiscal deficit had been reduced from an unsustainable 6.6% of non-resource GDP down to 1.6%. The new strategy – as set out in the 2018 Budget and confirmed in the 2019 Budget Strategy released in September 2019 was that this solid black line was going to fall to 1.0% in 2018 and 0.7% in 2019. 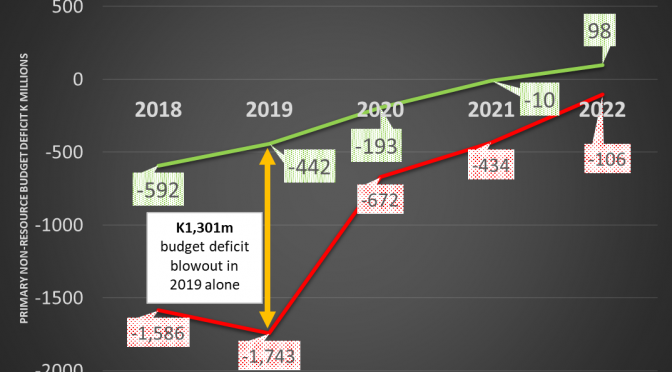 The graph shows the 2019 Budget estimates those figures have increased to 2.8% and 2.7%, a massive turnaround of K1 billion in 2018 and K1.3 billion in 2019. Remembering that total estimated expenditure in 2019 is just over K16 billion, these are major expenditure blow-outs relative to fiscal targets. When judging how the government was performing against the actual intent of the 2018 budget and actual progress against the MTFS, there is little doubt there has been a major breach of intent. 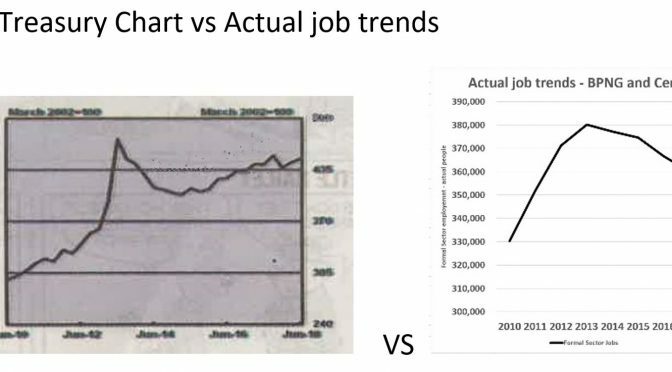 Showing a dotted trend line going down, and not showing the original targets in Figure 9, is another example of the Dr Jekyll, nice person World Bank in this report. 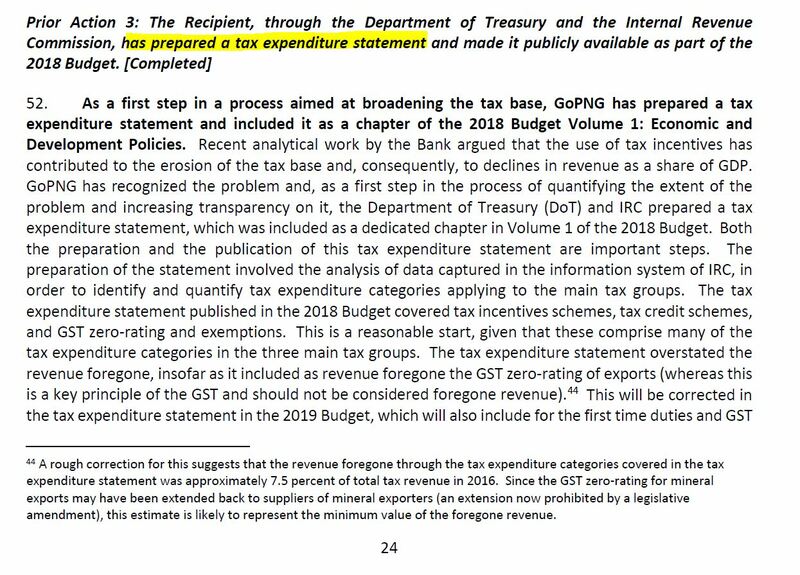 So what possible reasons did the World Bank give for this major breach of 2018 Budget intent and the MTFS? The World Bank’s discussion of this “policy deviation” is possibly most rationally explained by “the renewed focus on fiscal consolidation resulted in a sharp contraction in the fiscal deficit in 2017. However, this drove an increase in arrears, which necessitated a correction in the 2018 Budget”. The figure on these estimated arrears is K948.1 million by the end of October 2018 (a figure provided to the World Bank from the PNG government). Is this a credible explanation? Probably for 2018 – the government received nearly an extra K1 billion from the unexpected increase in LNG prices in the first 10 months of 2018. It is reasonable that unpaid contractor, wage, school, Provincial, District and other bills left over from 2017 received priority call on these windfall funds. This is a feasible explanation for the K994 million blow-out in the MTFS deficit target for 2018. But it does not explain at all the K1,301 million blow-out in the deficit target for 2019, or the K1,106 million blow-out in the following three years. 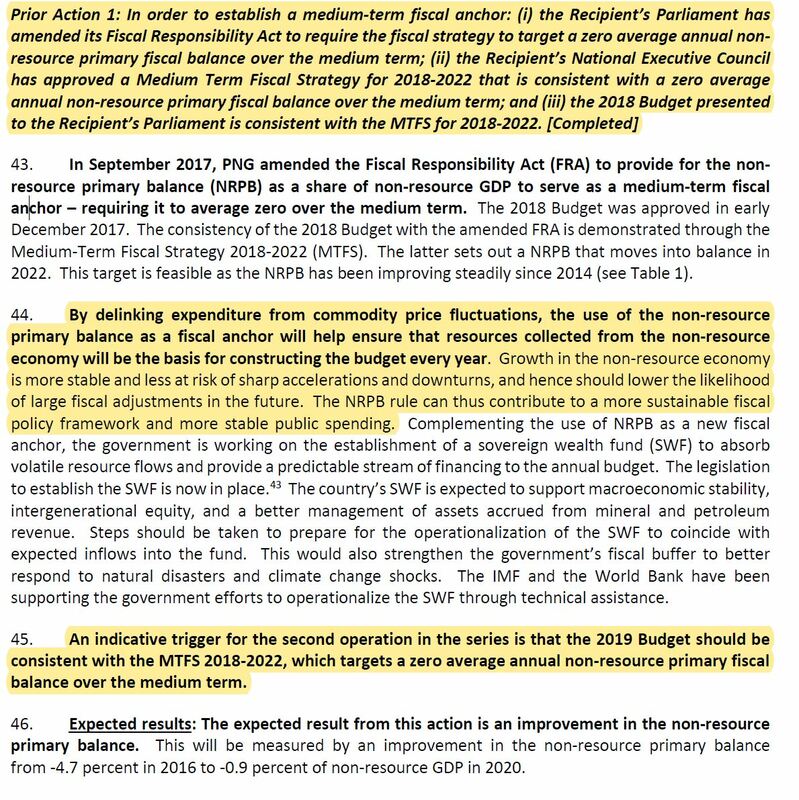 This extraordinary and unconvincing discussion of the fiscal consolidation concludes with the following very trusting statement: “The indicative medium-term budget framework for 2020-23 indicates that the government is committed to its MTFS targets for bringing the NRPB to a zero-average level”. Of course, the 2019 Budget Strategy commitments did not last for even two months. And getting the average to the zero level by 2025 (the MTFS target) would just require budget surpluses of K3.6 billion in 2024 and K4.0 billion in 2025 – levels never achieved in PNG’s history. “Now that sounds likely to me” says Dr Jekyll. “Get your head out of the sand” says Mr Hyde. Given the importance of the Medium-Term Revenue Strategy (MTRS), there is very little analysis of progress. 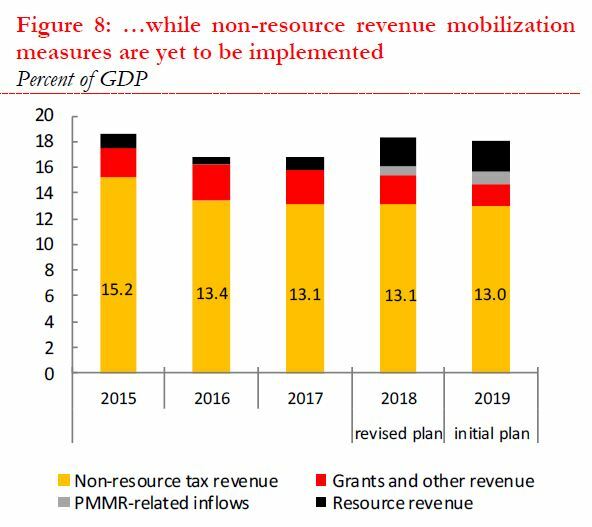 However, Figure 8 from the Update indicates things are not improving as hoped – indeed, the actual non-resource tax effort continues to decline rather than increasing strongly. 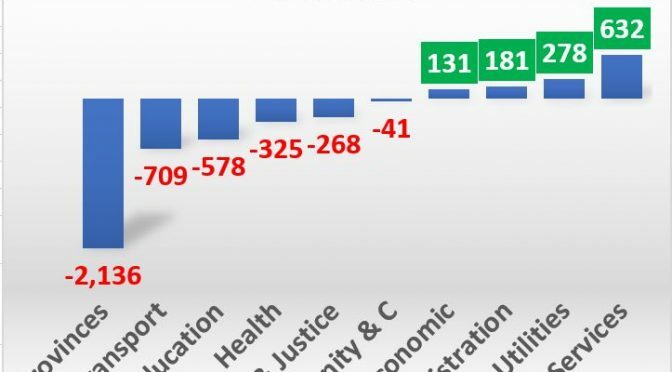 This is shown by the figures in the yellow parts of the following figure – falling from 15.2% of GDP in 2015 to 13.0% of GDP in 2019. 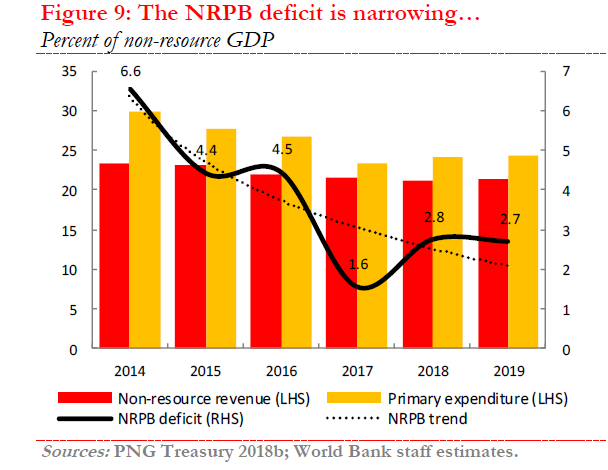 Declining non-resource tax revenues are one of the greatest economic challenges facing PNG. The lack of discussion of this failure, even to acknowledge that the original targets were unrealistic and that these institutional issues take a long time to turnaround, is a major omission. One can only assume this was a deliberate choice. This objective is strongly linked to items 3. and 6. The reason for moving the main budget deficit target to the “non-resource balance” is exactly this objective of disentangling expenditure from the resource volatility. This new objective excluded resource revenues from the base – they would go into the Sovereign Wealth Fund (SWF) or used to repay debt. 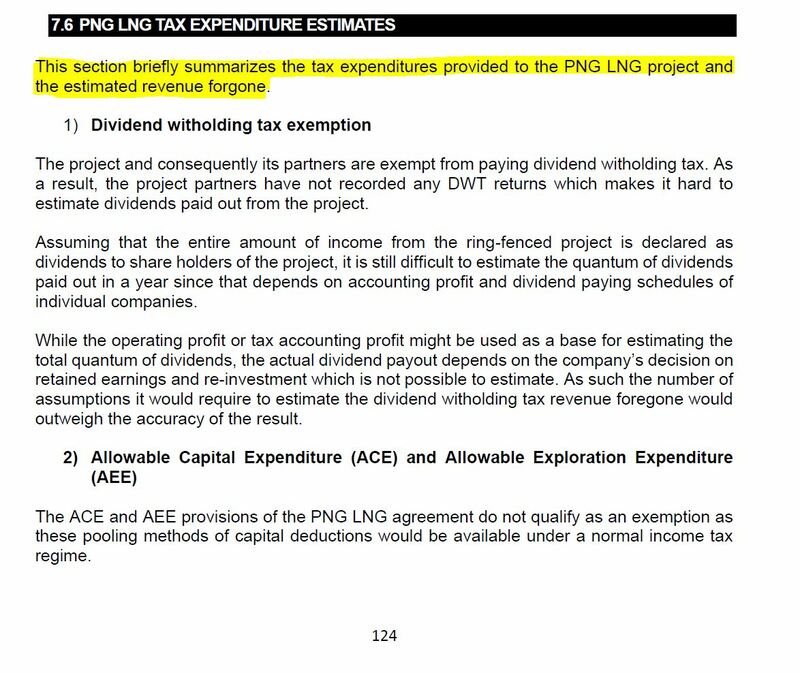 However, as covered in item 3, the government has completely abandoned this objective for 2019 and spent all of the expected windfall LNG revenues. With oil prices now well below their level at the time of the 2019 Budget, the government has likely gone and spent money it is now unlikely to receive. How have plans to establish the Sovereign Wealth Fund gone? Badly. 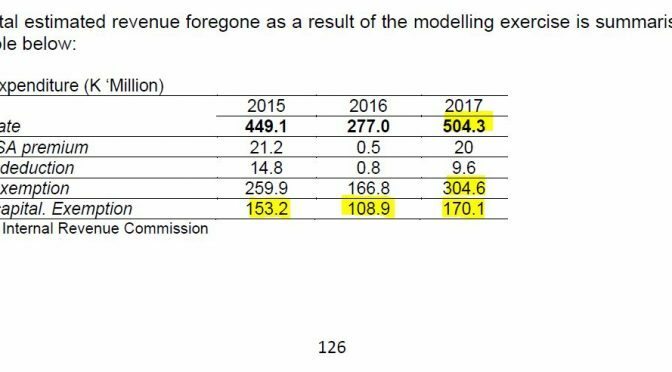 In part this is because the government has spent the LNG revenue windfall of 2018 (and expected for 2019). The only mention of the Sovereign Wealth Fund in the entire report (apart from it being mentioned three times in the reproduction of the MTFS) is in the discussion of “downside risks” where the World Bank simply states “To strengthen fiscal and debt sustainability the government should adhere to the adopted non-resource primary fiscal balance as a fiscal anchor and operationalise the established sovereign wealth fund”. Bottom line is that it has not been operationalised. Public service wage costs are taking an increasing proportion of the government’s budget. In 2016, there was a K470.1 million over-expenditure. The 2017 FBO released in March 2018 indicated the over-expenditure had dropped to only K113.2 million relative to the 2017 Supplementary Budget, and an overall K354.8 million (or 8.8%) higher than the 2016 actual. However, the 2018 MYEFO indicated the government had carried forward excess wage costs from 2017 of at least a further K417m (paid on 4 January 2018 and described as “to offset salary overrun” – p93) – so the 2017 wage over-run was in fact worse than 2016, a fact hidden by the 2017 FBO . In addition, the major expenditure increase in the 2018 Supplementary Budget was an extra K0.6 billion in wage costs – lifting 2018 wage costs estimates from K4.1 billion to K4.7 billion. 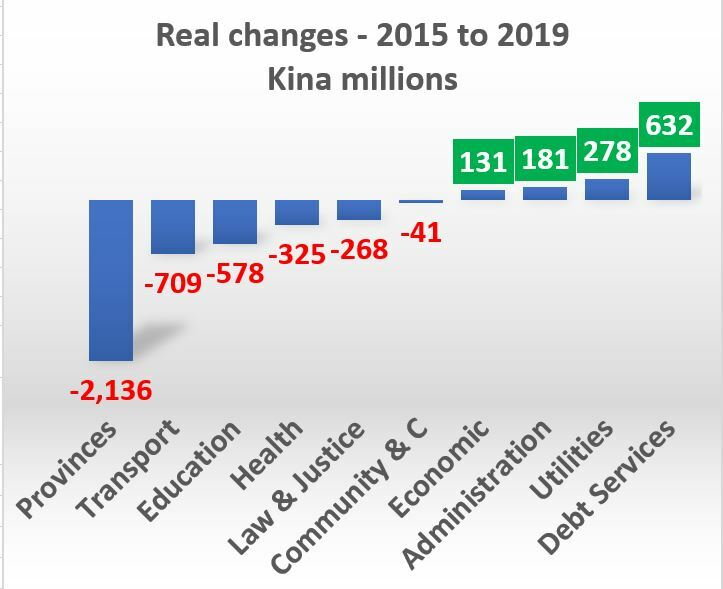 Even then, the PNG opposition claims the K4.7 billion figure is understated by K0.4 billion based on the government’s own public service expenditure review committee. This is not a picture of wage costs being brought under control. There are some positive signs that some agencies are finally being amalgamated, but overall, there remains a huge gap between the rhetoric in this area and action. The friendly Dr Jekyll characteristics of the first half of the report extends to comments on the costs of APEC. It uses the formal budget figures for APEC of K715 million, adds in the APEC Haus tax credit of K120 million, then notes some extra bilateral support, and concludes using the Post Courier as the authoritative source that “the total cost for hosting APEC events is estimated to be about K1 billion”. The basic arithmetic suggests the total level of external bilateral support for hosting APEC was K165 million (K1 billion less 715m less 120m). Mmmm, all those Chinese funded roads. Australia says its spent AUS130 (K310 million) on security support alone. Add US, New Zealand and other support. Add the various infrastructure facilities upgraded for APEC such as the international airport. Add in all of the other costs carried by usual departmental budgets. Given sensitive political perceptions around “Maseratigate”, the World Bank should not have put its name to such an inaccurately low figure. This is one of the clearest signs of the World Bank being focused on relationship building with the Treasurer, and possibly to help correct some of the political pain caused to the Government with an earlier IMF report simply reporting an initial PNG government estimate that APEC costs would exceed K3 billion. The PNG Government is in breach of its debt strategy. The World Bank report includes figures showing gross public debt to GDP will exceed the ceiling of 35% of GDP from 2017 to 2021. This is part of the game being played around GDP figures – discussed in greater detail in earlier articles. The World Bank is predicting a GDP growth rate of 5.1% in 2019. In understanding this figure, one needs to understand three characteristics of GDP growth rates. 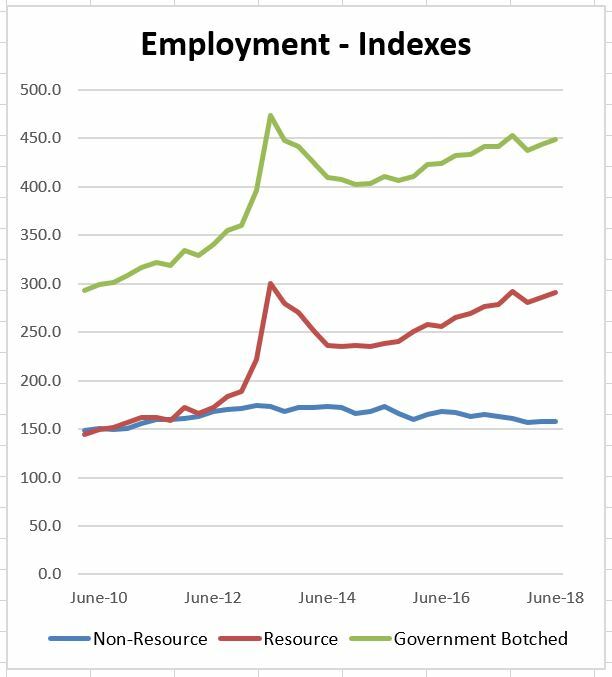 First, and this is the key issue in understanding what is happening in PNG’s dualistic economy, it is vital to separate out how the non-resource sector is going (this is the part of the economy which employs over 95% of the population) from how the resource sector is going (of most relevance to overseas investors apart from tax revenues). The non-resource sector is expected to grow at 2.4% in 2019, essentially the same as in 2018 (2.3%). This is less than the official population growth rate – so incomes will continue falling in real terms per person. Second, growth rates are an annual measurement. So 2018 was a bad year for the resource sector because of the tragic earthquake – and non-resource growth was minus 2.0%. Simply getting back to where things were in 2017 would have meant a positive growth figure of over 2% – but this simply reflects the statistical “bounce” from an annual growth figure. 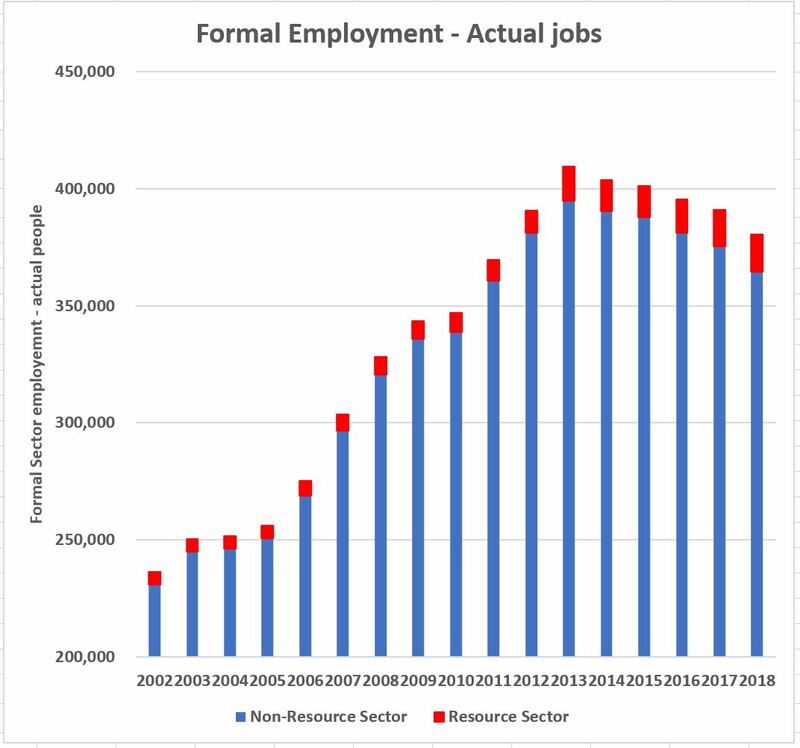 If a two year time horizon is used, the resource sector has grown by 0.3% per annum since 2017 and the non-resource sector has grown by 2.3% per annum. So the underlying growth path is still low – the 5.1% figure is the inevitable statistical bounce. Third, some commentators have suggested the increase is due to higher commodity prices. This is a common mis-perception. Real GDP aims to take out all price effects – so the increase in oil and LNG prices is actually taken out of the real growth in underlying production levels. There can be second round effects (such as higher commodity prices increasing government revenues which increase expenditure which can lift GDP growth rates). As noted above, the January 2019 World Bank Update is remarkable in its lack of reference yet alone analysis of the seven key macro-economic issues identified in the December 2017 Update. In just over a year, the World Bank has retreated from its own benchmarks. APEC cost figures add to this picture of the World Bank being at worst a spokesperson for the O’Neill government, at best simply being a friendly Dr Jekyll. The historic context suggests this Update is primarily about building a positive relationship with PNG’s Treasurer, Charles Abel. It certainly is not a report carrying the policy judgements and analytical rigour one would expect from the World Bank. A short-term focus damages the World Bank’s longer-term credibility. PNG’s economic statistics have been corrupted. Even the most basic economic statistic of “how big is the PNG economy” has been manipulated to tell stories convenient to the O’Neill/Abel government. 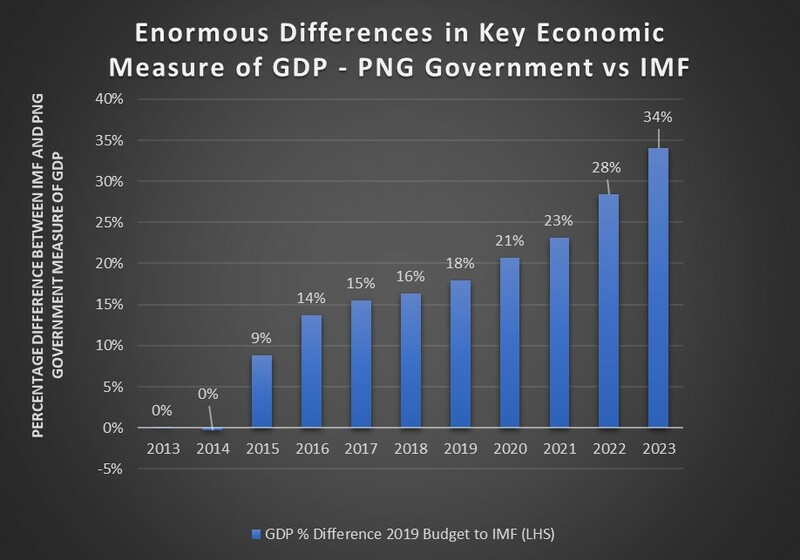 An extra-ordinary gap of 18% (so nearly one-fifth) has opened between the PNG Government’s measure of the size of the economy (economists call this “Gross Domestic Product” or GDP) and independent outside observers led by the International Monetary Fund. Half of this gap emerged in 2015 when PNG’s own National Statistics Office (NSO), with assistance from the Australian Bureau of Statistics (ABS), said the economy was actually 9% smaller than claims by the PNG Treasurer. The gap in this most basic economic measure is 34% (or one-third) by 2023. 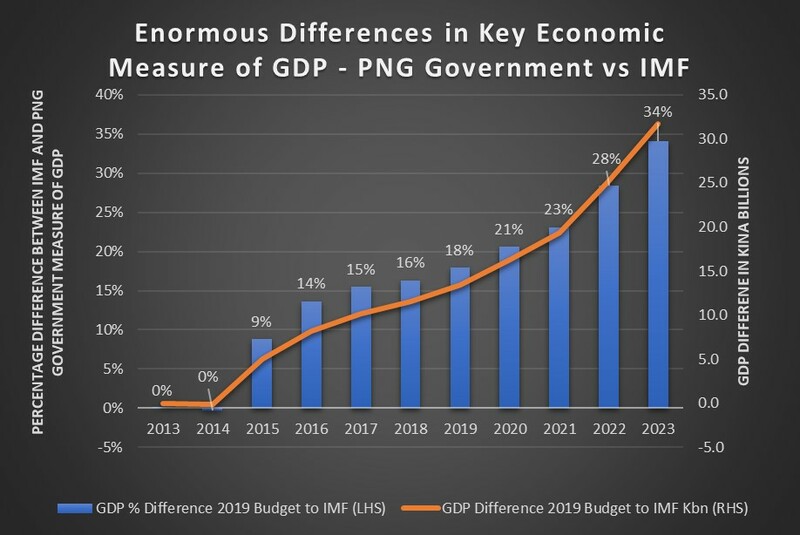 Specifically, the PNG Government claims the PNG economy will reach K125 billion while the IMF estimates it will more realistically reach 93 billion in 2023. 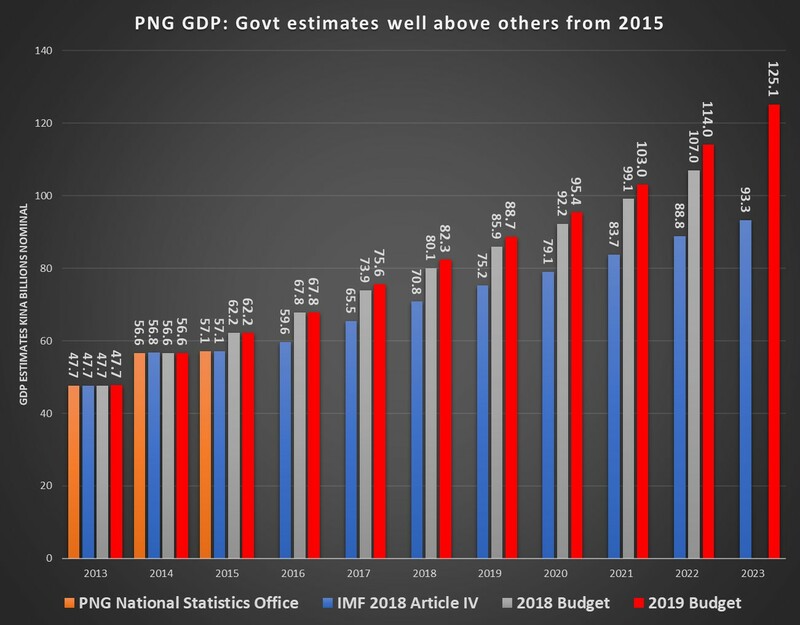 The difference is driven by the IMF using the actual NSO GDP estimates for 2015, and doubts about the O’Neill/Abel governments claimed rate of PNG’s economic growth. The NSO 2015 GDP figure was released on 9 March 2018. This date marks the clearest point from which the government started manipulating statistics – although there have been questionable practices in the past. The initial NSO release only included high level GDP information but indicated more details would be provided shortly. This never happened. 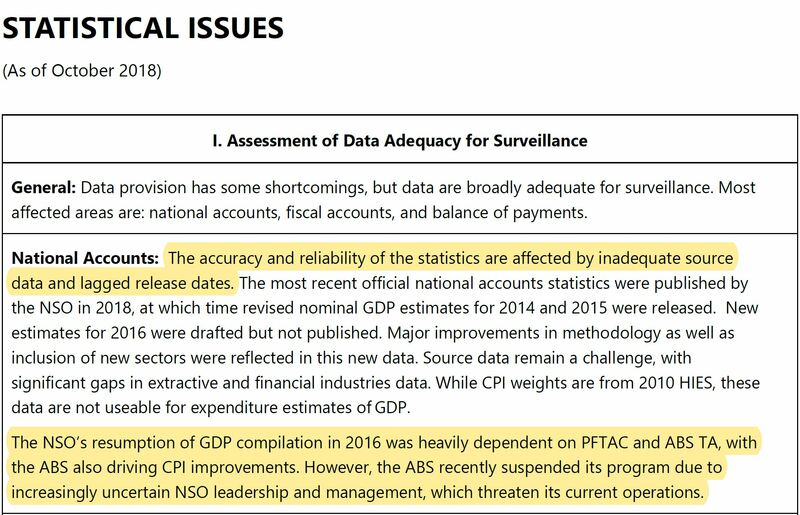 Apparently, also with ABS assistance, 2016 GDP data was also prepared. This also has not been released. The official attempt to explain the 9% difference in 2015 is lamentable and filled with basic errors. The blame is put on a new “price index”. However, one does not even use a price index when determining nominal GDP and the 9% gap is in nominal GDP. A price index is used for determining real GDP and differences in price methodology can have an impact. However, the government had been happy to use the new NSO price index for the eight years 2007 to 2014 when it was politically convenient. They just didn’t want to use the same price index for the ninth and tenth years of 2015 and 2016 when the results were politically inconvenient (details below). The government has used the involvement of the Australian Bureau of Statistics (ABS) to boost its own economic credibility – and it did so again in the 2019 Budget. However, when discussing ABS support for better GDP figures, the IMF notes “however, the ABS recently suspended its program due to increasingly uncertain NSO leadership and management, which threaten its current operations” (IMF 2018 Article IV p10). Given recent practices over the last year, this would seem a sensible approach from the ABS – there was a need to walk away to protect its own integrity. The International Monetary Fund is using the NSO figure for 2015 and presumably for 2016 – a fact that must greatly irritate the O’Neill government. • A higher GDP growth figure in the out-years counters the PNG Opposition’s call for an improvement in PNG economic growth rate. 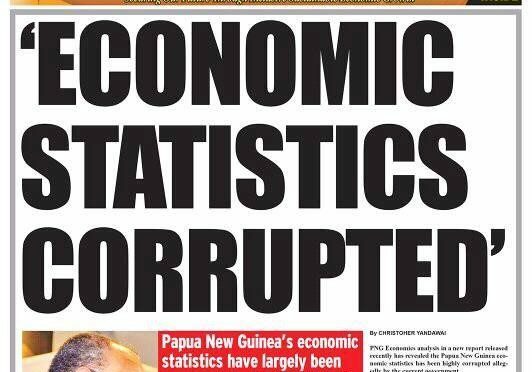 The growing errors and half-truths in PNG’s economic statistics can no longer be explained away simply by technical errors. The pattern is now clearly one of manipulating figures to fit the government’s economic narrative. 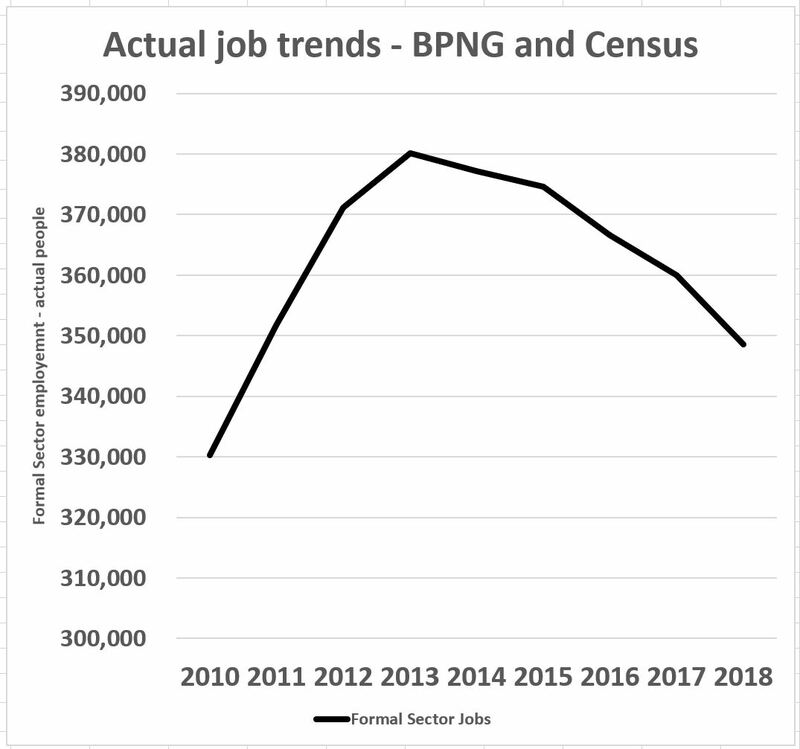 The credibility of PNG’s economic statistics – whether the size of the economy, economic growth rates, employment levels or budget outcomes – has plummeted. 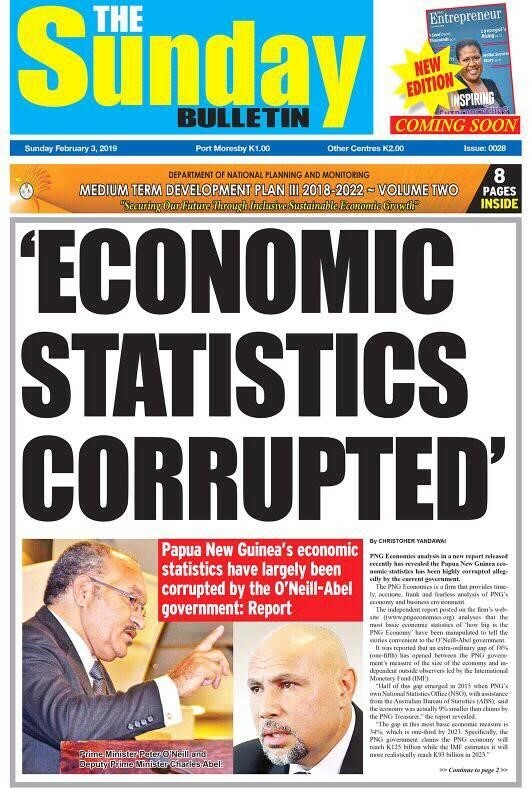 Let’s now call a spade a spade – the corruption of PNG’s political system has spread to its economic statistics. I now predict that official PNG government figures will indicate, no matter what the actual truth, that the 2018 budget outcome exceeded its targets and that growth will become more positive. 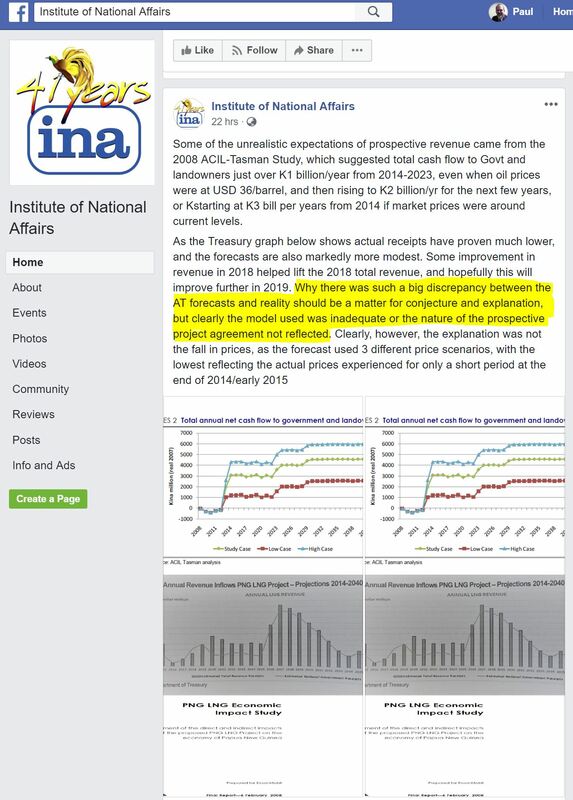 The government’s internal, overly optimistic narrative based on false figures will limit action on underlying economic issues such as a mis-priced exchange rate, poor micro-economic policies such as growing protectionism, dangerous approaches towards increasing foreign commercial debt to over 50% of its public debt, and ignoring business concerns about the 23 January anti-investment business regulation. Greece went down a similar path of manipulating its economic statistics to hide growing budgetary and other problems from Brussels. It did not end well. Given its current leadership, possibly it is not that surprising that PNG is heading down a similar slippery slope where statistics give way to political convenience. I fear the outcomes will be worse than the Greek experience. PNG’s institutions will struggle to turn the economy around when it is so far off course and its economic compass of genuine statistics has been so seriously corrupted.